Obama believes there is evil in this world. It just doesn’t exist outside of the US. Obama believes the true evil is here at home and broadcasts on talk radio. The mullahs and murderous regime leaders in Syria, Iran and Cuba… They’re OK.
Today comes this news that Obama will write to the evil leader of the Iranian Regime, Ayatollah Khamenei. 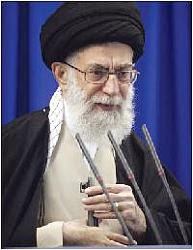 Iranian Leader Ayatollah Ali Khamenei clutches his Persian Mauser while preaching at Friday prayers in 2006. The Obama administration is leaning toward making a major diplomatic overture to Iran before the country’s presidential elections in June. This initiative could come in the form of a letter from President Obama to Supreme Leader Ayatollah Ali Khamenei, according to two senior European diplomats who have met in recent weeks with key State Department officials crafting a new US policy toward Iran. The letter would be aimed at initiating talks over the Iranian nuclear program and Iran’s role in neighboring Iraq and Afghanistan, the diplomats said, speaking on condition of anonymity because of the sensitivity of the issue. It would be the first formal communication between an American president and Iran’s leadership since Washington cut diplomatic ties with Tehran following the 1979 Islamic Revolution. Could we please stop with the “Obama is moderate” nonsense now?